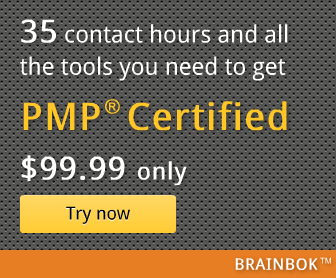 I passed my PMP exam today. 2. I took 2.5 months to read the PMBOK guide once. Wouldn't recommend that long but I took my own sweet time, mainly progressing on the weekends. During this phase, I also read Rita's book based on the old PMBOK version (V3) - had managed to get it from a library. 3. After this, I purchased the Andy Crowe book (based on V4 of PMBOK), and also gave one diagnostic test (SimpliLearn). I got just 58% in this one, but it was a very good reality check! good sites - one was this google group and another was this blog - http://www.deepfriedbrainpmp.com. This blog is really good to understand key concepts quickly and it kept me interested in the study. Kudos to Harwinder for the great work! 7. On the exam day, I reached an hour before time, was ushered in the testing room 15 mins before time. I tried to do a brain dump of formulae and processes in the first 15 mins for the tutorial. I was a bit tentative answering the first few questions and I encountered few wordy and confusing questions at the start. I took relatively longer time (than any of the practice tests) for the first 70 questions, then caught up as questions started getting better. I took my first break (10 mins) after 1.5 hrs with 120 questions completed, then completed remaining questions and started reviewing the marked ones. I completed until ques 60 and took another 5 min break. After this, I was quite impatient to know the result so didn't linger too long on the remaining marked questions. For certain questions, I could have sat thinking and debating for 10-15 mins between two contentious choices, but I was running out of patience, hence took my best call and moved on. I submitted the test with 1 hr 5 mins to spare, completed the survey quickly and then waited for the result - Although I was confident, during the test, it is very difficult to guess how you are doing so you never know until the final moment. Finally, was delighted to see "Congratulations"! and it was a dream come true for me. My best wishes to all the aspirants!